The year 2017 was a time of quiet realignment in Asian-inter-state relations, as the balance between hedging and engagement was shifting. Trump’s policies to the region left US allies eyeing new partners, while Xi’s assertions of leadership—in the absence of pushback from the usual quarters—made it advisable to stay on China’s good side. Japan, as well as South Korea and Vietnam, curried favor with Trump, but courted Asian partners more assiduously as well. In this commentary, I draw on recent Japanese sources to depict how Japan has moved to bolster relations in Asia, ranging from the region’s southern to northern tier. Especially Abe’s ties to Xi and Putin are indicative of broader balancing among great powers rather than just polarization in support of the United States as many expected was taking place. Hosoya Yuichi in Yomiuri on November 19 argues that the world has reentered a 19th century great power game with deals instead of ideology, amid difficulty in making long-term strategy as the world order is being transformed.1 The new era exemplified by Trump differs profoundly from the Cold War era. The same paper carries a piece on Abe’s similarity to Bismarck by Hosoya. Abe is trying to shape an Asian order. As a realist, reaching beyond bilateralism, linking multiple powers as Bismarck did with the five great powers of Europe. With Japan, as one of five powers (the United States, China, Russia, and the EU), Abe seeks a stronger ASEAN against China’s maritime moves, closer ties with the EU and Russia despite their divisions, and stronger US ties above all; but Abe also must respond to Trump’s shift from values to deals focused on US interests. Abe’s diplomacy makes him the 21st century Bismarck, Hosoya argues. This is a major shift from even recent Japanese diplomacy. The translated title of one Japanese book released in August 2017 is Xi Jinping vs. Trump: Who Will Rule the World?4It portrays a US retreat with TPP and a Chinese advance with BRI. It is this environment that Abe has been striving to navigate in recent months. In one book published at the end of July that anticipates a Sino-US economic war, Japan’s policy toward China is described as reduced hedging and greater engagement. The author, Tsugami Toshiya, does not attribute this to an improved image of China in Japan. He equates its image with that of Meiji-era Russia and calls it a hypothetical enemy. Instead, he argues, Japan has been awakened from a half-century slumber through Brexit, Trump’s victory, and the new strange image of the developed West, even as it finds reassurance in Abe’s leadership. In this context, Japan decided that its policy toward China was leaning excessively toward hedging, which is risky due to: 1) shared interests, such as resolution of the North Korean problem; 2) the possibility that US ties with China would improve, as Trump seeks “America First” deals, leaving Japan behind; and 3) the lack of appetite for a forceful hedging strategy by Japan in Southeast Asia, where Japan and China are most competitive.5 Thinking in Japan about the AIIB has changed, as over the past two years the sense of Chinese unilateral leadership has weakened, after cooperative arrangements have been arranged with the World Bank, the ADB, and the EBRD. Similarly, Japan’s attitude regarding the BRI has shifted from three years ago, when it was viewed as a project to use Chinese capital for high-speed railroads not necessarily in the interest of the host countries. The Trump administration had already begun in May looking at this as a way to expand US exports, and on June 5 Abe spoke of wanting to cooperate with it. Adding to the motivation to adjust Japanese policy was the US decision to withdraw from the TPP talks, leading Japan not only to pursue “TPP minus one,” but also to look again at economic ties with China bilaterally and in regional context. At the end of 2017, with LDP Secretary General Nikai Toshihiro taking the lead, there was hope for Sino-Japanese relations beyond anything seen since their 2012 clash. Abe had been wooing Putin for five years, and some thought that disappointment over their summit in December 2015, the slow follow-up to plans for joint economic activities on the disputed islands, and Russia’s soft stance toward North Korea would have dimmed Abe’s ardor. Yet, plans for his visit to Russia in May 2018 after Putin’s expected reelection were heralded in official circles in Tokyo and part of the media as the long-awaited opportunity for a breakthrough. The idea that Russia will join Japan in balancing China as well as agree to a territorial deal is nurtured as a sign that there is promise in an autonomous foreign policy by Japan. writes, has taken the form not only of economic projects but also of values. Indeed, Japan has stood for free trade, freedom of navigation, and the rule of law, while deepening relations of trust. 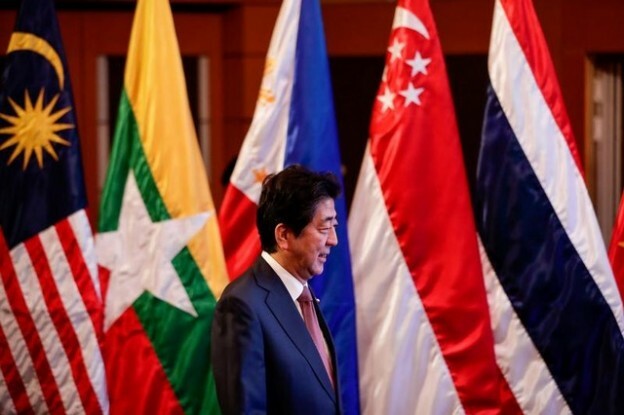 The articles cast doubt on their wide appeal, noting the diversity of ASEAN’s members, but credits Japan’s softer advocacy as more appealing than the positions of Western states. As China gains ground, Japan’s recent appeals to shared values have faced more obstacles. Trump has cut the ground from under joint advocacy of values, as he has undermined TPP as a new regional framework. Yet, the overall message is that ASEAN has a special place in Japan’s diplomacy and can continue to serve as a target for an autonomous foreign policy. Kaneko Yoshiki in the September 2017 Toa sees uncertainty in ASEAN due to China and Trump, spurring an age of power politics and leaving ASEAN at a crossroads. In this dangerous time China is pressing for leadership, ASEAN is losing its cohesion, and Trump is weakening the values central to the resistance to China.8 Balancing between China and the United States is more challenging. Japan’s limited options are not highlighted, as it competes for large infrastructure projects, boosts ASEAN, and targets particular countries in Southeast Asia. Iida Masafumi in the same issue put the stress on joining with the United States in rallying the region to resist Chinese moves to dominate the South China Sea. The main issue is not sovereignty but the shape of the regional order.9 As in many Japanese articles, the damage caused by Trump is only obliquely covered, and the challenges faced by Japan in rallying countries to resist China are not considered in any detail. How has Japan responded to the Trump effect in Southeast Asia? First, it has pushed for TPP-11, trying to fill the leadership vacuum. Second, it has tried to keep values as a regional appeal, at least finding verbal common ground with Trump on freedom of navigation. Third, it has taken credit as the co-originator and leader in “Indo-Pacific” strategic thinking now being pushed by Trump. This area is important for Japan, especially as a target of great power maneuvering in which it is now active. Asahi on November 11 writes about overcoming historical consciousness and moving Japan, China, and South Korea on a path to an Asian community (kyodotai). Noting that populism often involves antipathy against Japan, China, or Korea,10 it suggests that a shared sense of crisis—North Korea, aging, population decline, and economic stagnation—could transform attitudes if media and think tanks were on board. In contrast, on November 10, Sankei points to Japan’s strategy for East Asia as at odds with its neighbors’ and drawing closer to the United States, agreeing that the military option is on the table versus North Korea.11 Freedom and national security are the far-right mantra, but not the progressive focus. Neither side puts much hope in Abe’s pursuit of Putin, and they differ sharply in regard to his pursuit of Xi Jinping. Neither subscribes to Japan tying itself closely to the United States, both due to historical identity. For the idealism of the progressives, community is preferable to power balancing, while for the far-right realists, compromises with China and Russia must be avoided. These are not the voices of realist power balancing that are now steering Japan’s policy. Whether Abe is today’s Bismarck, responding to Trump, or driven by deep national identity aspirations, his diplomacy toward China, Russia, and ASEAN in recent months suggests a degree of autonomy from the United States that few perceived. If the far right and the progressives are wary of Abe’s “realist” bent, it has gained new momentum in the last months of 2017 even as Abe is, arguably, hugging Trump at least as closely as any other foreign leader has. Abe is demonstrating that alliance ties do not exclude foreign policy activism at a time of great flux in East Asia. 1. Yomiuri Shimbun, November 19, 2017. 2. Yomiuri Shimbun, October 19, 2017, p. 3. 3. Asahi Shimbun, October 19, 2017, p. 14. 4. Endo Homare, Xi Jinping vs. Trump: sekai o seisuru? no wa dare ka? (Tokyo: Asuka shinsha, 2017). 5. Tsugami Toshiya, “Beichu keizai senso” no neijitsu o yomitoku (Tokyo: PHP Shinsho, 2017). 6. Sato Masaru, Shukan Gendai, November 11, 2017. 7. “ASEAN 50nen no inpakuto,” Gaiko, No. 45 (Sept./Oct. 2017), 47-80. 8. Toshiki Kaneko, Toa, September 2017. 9. Kaneko Yoshiki, “ASEAN sosetsu 50nen: sono seika to Beichu taiji shinjidai no ‘Chugoku keiryo,’” and IIda Masafumi, “Minami Shinakai no yui kakuritsu o mezasu Chugoku,” Toa, September 2017, 10-19, 34-42. 10. Asahi Shimbun, November 11, 2017. 11. Sankei Shimbun, November 10, 2017.